Geostatistical data are data that could in principle be measured anywhere, but that typically come as measurements at a limited number of observation locations: think of gold grades in an ore body or particulate matter in air samples. The pattern of observation locations is usually not of primary interest, as it often results from considerations ranging from economical and physical constraints to being ‘representative’ or random sampling varieties. The interest is usually in inference of aspects of the variable that have not been measured such as maps of the estimated values, exceedence probabilities or estimates of aggregates over given regions, or inference of the process that generated the data. Other problems include monitoring network optimisation: where should new observations be located or which observation locations should be removed such that the operational value of the monitoring network is maximised. Much of this chapter will deal with package gstat, because it offers the widest functionality in the geostatistics curriculum for R: it covers variogram cloud diagnostics, variogram modelling, everything from global simple kriging to local universal cokriging, multivariate geostatistics, block kriging, indicator and Gaussian conditional simulation, and many combinations. 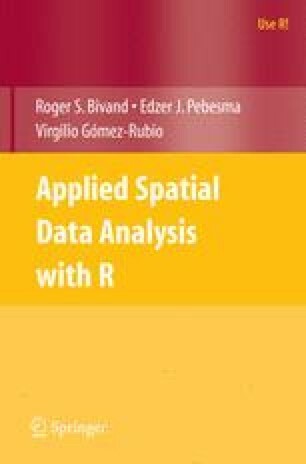 Other R packages that provide additional geostatistical functionality are mentioned where relevant, and discussed at the end of this chapter.